“The Department of Health conducts regular testing of seawater and has closed the beach to swimmers and watersports today, due to bacterial levels above the Department’s acceptable limit,” the Ministry said. “Further testing and evaluation is underway and the beach will reopen once bacteria levels drop to normal. Inclement weather and wind direction can have an effect on bacterial levels. “The concessionaire at Tobacco Bay Beach has been informed. 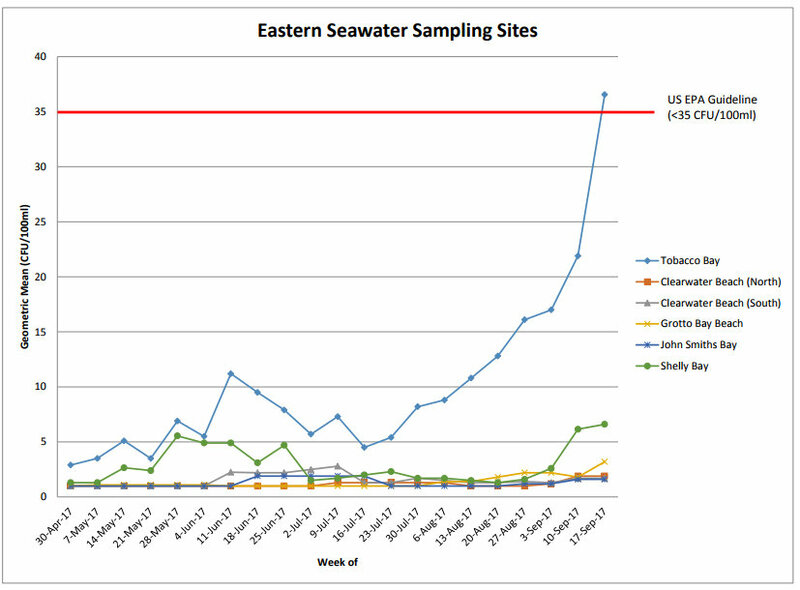 For more information about Government’s seawater testing, see here. Update 2.15pm: The sample results were just updated to included Sept 17th, so we amended the PDF below to show the more recent ones, and also posted a screenshot above. This is a bold step and it begs the question what is the cause of this spike and can they stop it at the source or is this an ongoing issue of pollution? And you believe that? Without facts and evidence? Go have a swim. Take the family. Yes it certainly does. LOL Just have a read!!! Even though I read that part, I can understand why he/she is questioning it. This sounds quite strange. I’m fifty years old and I can’t recall a beach being closed for this reason. Lots of weird stuff going on. What is the genus and species of the bacteria detected? The fungi or unicellular microorganism is oba/UBP bacteria 12 seat! The organism is known to split and form a third party. Yes, it begs the question does it come from human feces? Is this why we had the recent fish die off? And what is going to happen when they build another hotel on the beach there in St. Georges? Where are those feces going to go? I think it’s the “figment of your imagination” guy. That was a lot of BS. @ Zevon,you are right,it IS b/s….from de plp floaters. what is the source of the bacteria? what type of bacteria is it? I really wish Government would be a lot more forthcoming in its press releases. Any connection with the fish die off event? No one has mentioned just how poorly this beach is performing historically compared with the other beaches in the east. Even though Tobacco Bay has been well beneath the threshhold since April, in that timeframe the only beach that came close to its level was Shelly Bay. Personally, I feel this data should’ve raised alarms as far back as June when the first notable spike happened. Failing that, some investigation should’ve taken place in July when the rise in levels began to take off; even Shelly Bay was comparative with the other beaches at this point. Why aren’t they testing the beach at Fort St. Catherine. The levels seem to have steadily increased from July through September. Coincidentally this is when the beach is most busy with locals and tourist’s. It suggests that the venue is overused. Good point, someone needs to immediately send all these questions to the Department of Health or the Minister for answers. Where do you think all the sewage waste has been dumped for the last fifty years folks. News flash” Just off Tobacco Bay. I don”t go there because of this very reason. Where exactly? And all the sewage from where? Don’t most houses have sas pits….please respond…. Looks like it’s directly related to the popularity of the location and the ability for the water to circulate out. hmm looking at the charts it almost looks like beach activity could be a factor. one question. where is the waste from the beach bath rooms going? Also there are tides and a pipe for waste off northshore, doesn’t go out far enough or there is a hole innit. we need to do something about the dumping of raw sewage off the east end. Let’s fix it for God’s sake! Many thanks for the received well wishes and park concerns. We’re happy that the Park has reopened with so much amazing weather left in the year. Based on considerations, the recent Mermaid event with an increased no. of persons using the beach, coupled with the prevailing wind conditions, could have been the source of the uptick. There is also run off from land with large pools of puddles from clogged drains nearby, as result of recent heavy rains. With monitoring and infrastructure developments, anomalies will be addressed and in meantime we’re happy a clean bill from Health has been provided. Mentioned elsewhere, the concession’s deck side restaurant is still open and has some cool October weekends coming up too… (Tobaccobay.bm).